Interested faculty, staff and students met Feb. 26 to kick off planning for the upcoming Day of Dialogue. The campus-wide event is scheduled to take place on Tuesday, Sept. 25. during the 2018 fall semester. Renee Madison, senior adviser to the president for diversity and compliance, along with Anne Harris, vice president for academic affairs, spearheaded the inaugural event in the Daseke Room at Hoover Dining Hall. 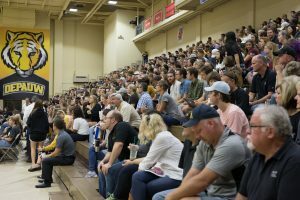 Every year since the Day of Dialogue’s first event in 2015, all DePauw University classes are cancelled so that students may attend the event, which DePauw’s website describes as a community-building event meant to discuss topics such as bias, difference, privilege and identity. Poor past attendance—along with the hurdles of overcoming uncomfortable feelings brought out when sensitive issues (such as race, gender and identity) are discussed—were blamed as major setbacks in the day’s overall effectiveness and impact by students and faculty present. “I think that it [Day of Dialogue] should be mandatory and I think it should talk about the issues that people face,” said first-year student Ja’na Baylor. The goal of Monday’s meeting was to gather suggestions for possible themes, structures, designated workshops and ideas for keynote speakers, according to Madison. On the whiteboard, Madison outlined four categories of discussion: themes, workshops, keynote and miscellaneous. Attendees were encouraged to share their thoughts regarding topics they feel should be addressed during the September event. Harris said planning is beginning earlier this year, to include more faculty and students in the process. Topics such as micro-aggressions, the connection between Day of Dialogue and DePauw’s curriculum, “#MeToo” movement-related issues (i.e. gender, gender identity and sexual assault), non-Christian religious identities, what constitutes a safe space, and making Day of Dialogue more than just a day were addressed throughout the meeting. 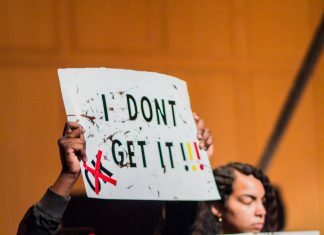 Madison added that, although the administration tried to make the 2015 Day of Dialogue mandatory, they received several comments from both faculty and students saying that attendees would learn more if the event were optional. Day of Dialogue 5.0 meetings will continue on March 5, March 19, and every Monday after Spring Break from 11:30 a.m. to 12:30 p.m. in the Daseke Room. Coordinators Harris and Madison encourage thoughts and ideas for the event to be submitted via the Google Form embedded in the initial kick-off email sent to faculty, staff and students.